If you don’t have a green thumb it doesn’t mean you can’t have plants in your home or get in on the current succulent craze! You totally have options, which is why I’ve created this list of 7 easy to grow succulents for beginners. Though there is a lot to learn, there are several succulents for beginners available that are very forgiving to neglect and beginner mistakes. 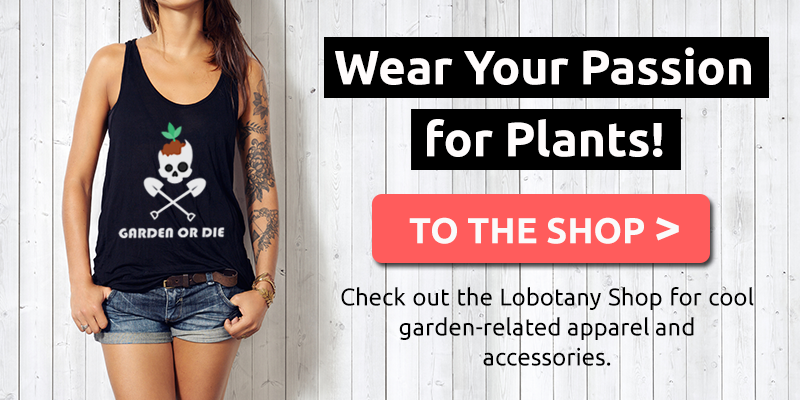 The succulents included in this list are also normally quite easy to come by, so you shouldn’t have much trouble finding them locally. 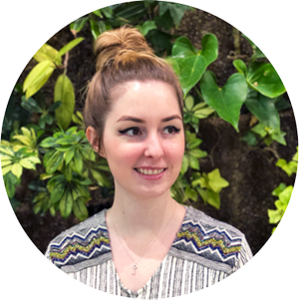 I’ve also included links to some of my favorite online resources for succulents, so if you live in the United States you can have new succulents sent directly to your door. Are you ready to get growing? You’re probably well acquainted with the aloe plant if you’ve ever suffered a bad sunburn. The sap from this plant not only soothes sunburn, but the plant itself is a super easy to grow succulent and one of the most popular succulents for beginners! There are so many different varieties of aloe to grow — ones with zebra stripes, speckles and spots, a crown of pointy leaves, you name it. Any variety you choose will have your windowsill looking sharp. Aloe succulents are super easy to care for — give them a nice windowsill, a container with good drainage, and water whenever the soil dries out. These little guys aren’t picky, and will thrive and look pretty whether you take good care of them or have a tendency towards neglect. 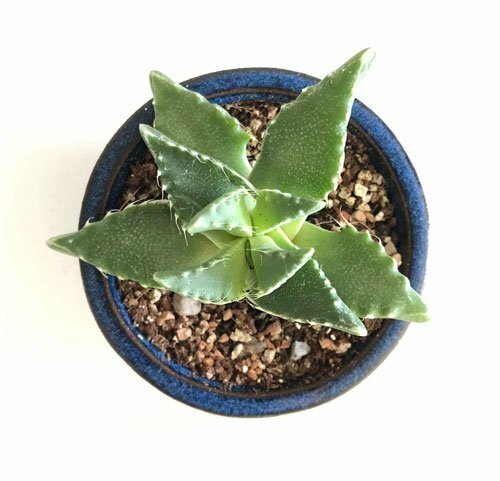 >> Get the beautiful ‘Crocodile Plant’ aloe variety pictured above from Leaf + Clay. One of the most popular indoor succulents for beginners, the jade plant come in all sorts of interesting varieties. You can buy them as tiny baby plants or larger and more mature in its tree-like form. As a succulent, your jade plant will need well-draining soil like a cactus mix, and the sunniest spot you can provide it. Jade plants like to have their soil dry out completely between waterings — but don’t hold back on the water when it is time to do so. It’s much better to give your jade plant a good soaking when it needs it than to give it tiny sips of water more frequently. 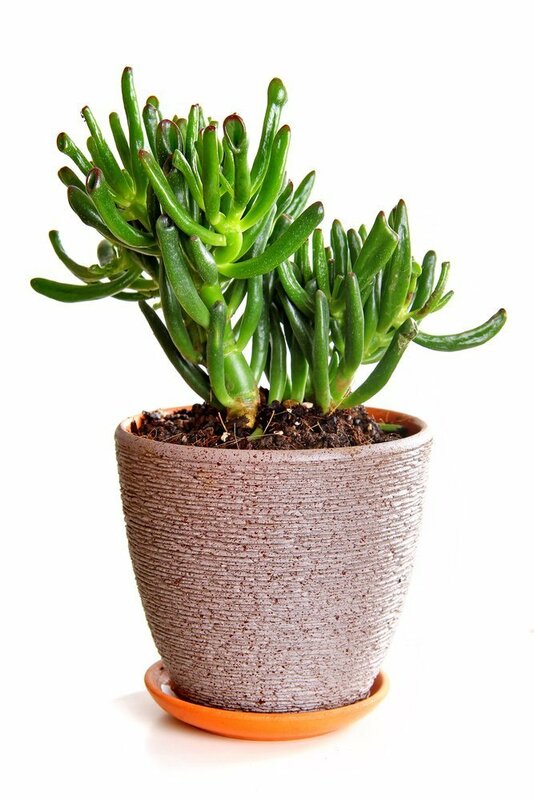 You can find regular varieties with rounded leaves, or more unique varieties like the Crassula ovata ‘Hobbit’ or ‘Gollum’, which have weird finger-like leaves (shown above). There’s a jade plant for everyone, no matter your taste! >> You can buy the unique ‘Gollum’ variety from Leaf + Clay right here. This classic succulent is one of the most commonly seen these days. Echeveria plants form beautiful rosettes in all sorts of colors including pastels. The biggest problem beginners face with echeveria is overwatering — they’ll rot if they get too much water. To avoid this, make sure you plant your echeveria in a container with a drainage hole and fill the container with a well draining potting mix like cactus mix. Only water your echeveria when the soil has completely dried out — then you may water it deeply until water comes out the bottom drainage holes. Echeveria does require more sunlight than most succulents, so offer yours the sunniest spot you’ve got. In the winter you may need to supplement it with a grow light. When echeveria doesn’t receive enough light, it was start to stretch out and grow tall, losing its compact rosette shape. Though there are many varieties of echeveria available, the more colorful pastel varieties usually require more sunlight. So if you’re growing yours indoors, try to stick to echeveria in shades of green to improve your chances of success. >> Purchase the Echeveria ‘Chris’ variety from Leaf + Clay. Haworthia is the perfect easy to grow succulent for beginners or those who are just starting out growing plants indoors. These spiky succulents come in all sorts of interesting varieties and are super easy to care for. They thrive on neglect and can survive with only minimal amounts of water. 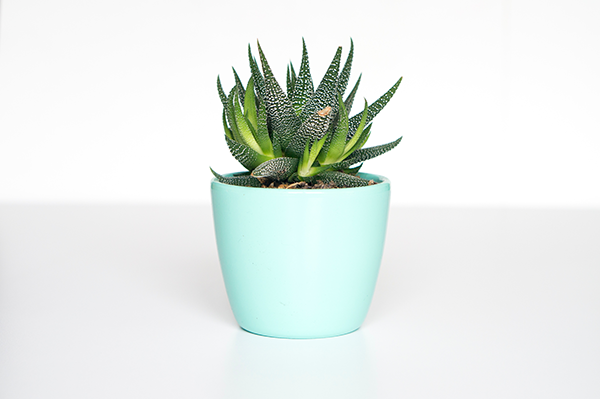 Aim to water your haworthia succulent whenever the soil dries out completely. Haworthia like bright, indirect sunlight, so they’ll be happy near a window as long as the sunlight isn’t streaming in all day long. Haworthia plants are a bright and vibrant green, and some varieties have striking stripes and spots. 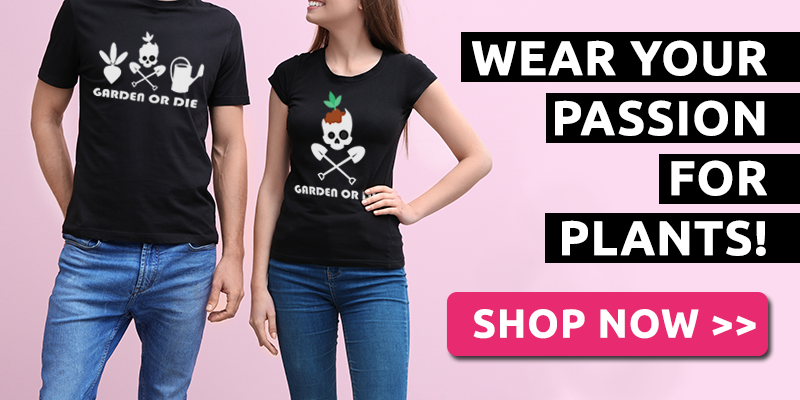 They’re also quite common, so you shouldn’t have much difficulty finding one at a local hardware store or nursery. Alternatively, you can order one online at the link below. >> Get your own Zebra Haworthia succulent plant here. If you’re looking for a conversation starter, the Tiger Jaws succulent might be for you. Just looking at a Tiger Jaws succulent you can see where it gets its name — its leaves look like a bunch of tiny tiger jaws complete with sharp pointy teeth! It’s both visually interesting and one of the easiest succulents for beginners to grow. In the fall and winter, Tiger Jaws also produces bright sunny yellow flowers up to two inches in diameter. Keep your succulent in a bright window with direct sunlight — your Tiger Jaws will need at least four hours of direct sun each day in order to product flowers. To take care of your Tiger Jaws succulent, plant it in a container with a drainage hole and good well-draining soil like a cactus mix. Water whenever the soil dries out completely, and water deeply. >> Purchase a Tiger Jaws succulent for your sunny windowsill right here. Burro’s tail or donkey’s tail is a super fun and easy to grow succulent that looks absolutely fantastic in a hanging basket. Long strands of these luxurious “tails” streaming from a basket will give your home some added flair and character. This sedum variety is very easy to grow and propagate. If you’ve ever fancied starting new baby plants from fallen leaves, give it a try with your burro’s tail! Just remove a leaf and place it on top of the soil in a small pot, and keep the soil damp. The leaf will eventually root, and in a few weeks to months you’ll have a brand new burro’s tail plant. Burro’s tail likes bright indirect light or partial sun, so give it a spot near a window. Good drainage is also important, so plant it in a container with a drainage hole and cactus potting soil. Don’t over water, or your burro’s tail could rot! Be sure to let the soil dry out completely between waterings, then water it deeply. >> Get your own pot of burro’s tail from Leaf + Clay here. The Mother of Thousands variety of the kalanchoe succulent is a fun and interesting plant to grow. It is also able to take quite a bit of neglect and abuse, so if you are a first-timer this plant is a great choice. A great succulent for beginners, Mother of Thousands will be happy as long as you give it as much light as possible and a pot with good drainage. Be sure to plant yours in a container with a drainage hole and a well draining potting mix such as cactus mix. 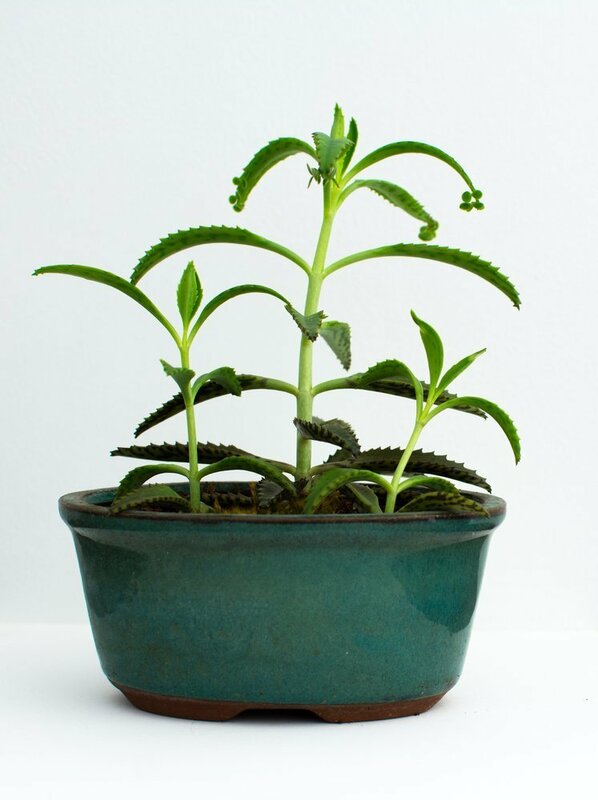 Water your kalanchoe when the top inch or so of soil is dry to the touch. 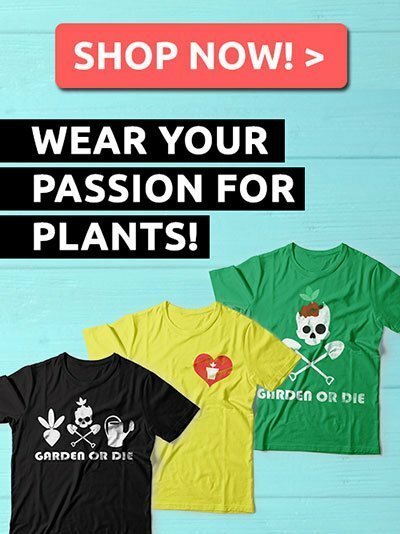 A word of warning: be careful if you’re growing this plant outdoors! The Mother of Thousands succulent definitely lives up to its name — it can produce thousands of tiny little ‘plantlets’ on the edges of its leaves. These plant babies will eventually fall of and start growing in the soil wherever they fall. This can be quite bothersome when they start taking over your yard! But kalanchoe does great in containers as well as indoors where you shouldn’t have as much of a problem. What are your favorite easy to grow succulents for beginners? Share your thoughts or any questions you may have in the comment section below!